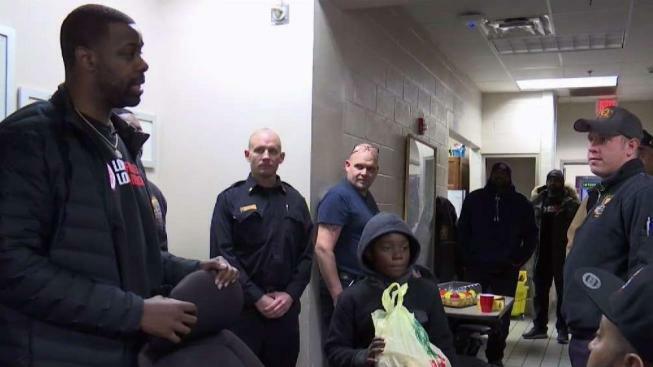 Many first responders spend the holidays away from their families, so to show his appreciation, a D.C. firefighter drove to every fire station in the city to deliver free turkeys. “I’m happy to be able to serve the firefighters today,” Jonathan Tate said. The First Annual Local Food for Local Heroes Turkey Drive is part of Tate’s nonprofit called Food on the Stove. “We provide tools and resources to help firefighters live a healthier lifestyle,” he said. Tate’s father also was a D.C. firefighter. He died after three heart attacks and battling cancer. “That’s important to me, that another 15-year-old boy doesn’t have to, whose dad is a firefighter, doesn’t pass prematurely,” Tate said. Honoring his father’s memory, Tate visited 34 firehouses this Thanksgiving. “I just want to make sure that we show our appreciation for them,” he said. He hopes to expand next year and deliver free turkeys to firehouses in Maryland and Virginia too. All the food was donated by families and small businesses.